We survived our first week with Bee, and he survived too! Mummy went back to work on Monday and we were not sure how the week would go. Bee is a breast fed baby, he is fed on demand which is usually every two to three hours. He is also allergic to dairy and soya so weaning is a little bit tricky. Luckily for us Bee is the the happiest and most content baby ever. He only cries when he's hungry or tired and has been an absolute delight. He is napping in his pram at the moment as he is used to that (falls asleep coming home from the school run). He was fine all week, just a little hiccup on Tuesday when he was missing his Mummy and needed lots of cuddles and cwtches to get to sleep. He had a lovely afternoon nap on me. As Bee is breast fed on demand I have had to nmanage feeding him expressed milk in a bottle. He would drink a whole bottle full if allowed but this is not good for breast fed babies. They should have smaller amounts and be paced fed with a bottle. This is totally different to the way babies are fed with formula. I watched videos and it is basically keeping the baby upright (not lying down) and the bottle horizontal. The baby must stay in control of the flow. 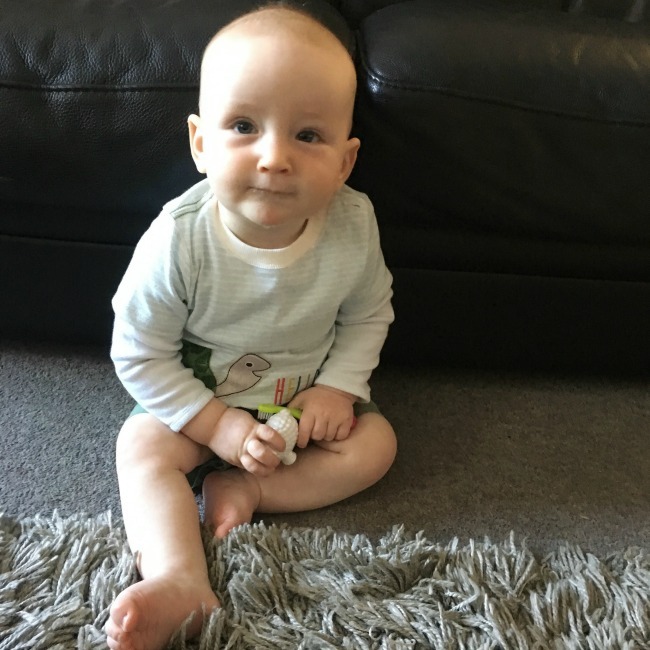 If the baby is lying down and the bottle tilted then they have to swallow and cannot pause as a baby would do on the breast. As expressed milk is precious I also tried hemp milk in his bottle and in a cup - no way! He hated it, although he has it on cereal in the mornings. We are going to try a different milk next week. We want it to supplement his breast milk, and not to replace it. Where's Bee? Here he is! Bee is so different to Bear, he absolutely loves food. He eats everything, well almost everything, and the joy on his face is wonderful to see. We are doing Baby Led Weaning (BLW) with Bee, we did a mixture with Bear. Some BLW and some purees. 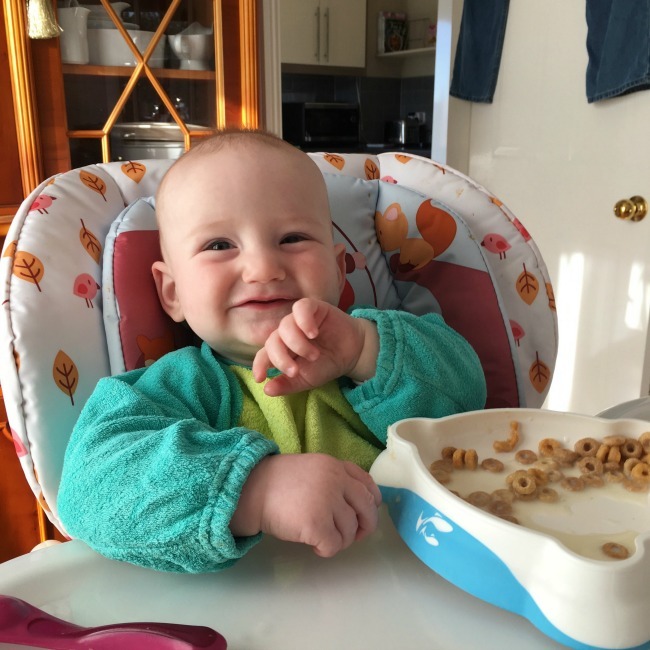 It is trickier with a baby with allergies, Bee is allergic to dairy (Cows Milk Protein allergy -CMPA) and soya, and a few other things such as white fish and oats. 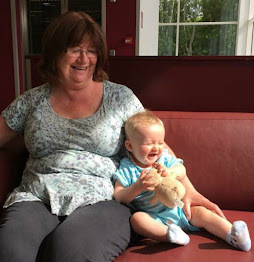 I will write a series of posts about weaning a CMPA baby - I thought it would be hard but it isn't so bad. Mummy sat with me and we wrote a list of all the food Bee can have, all he mustn't have and those he hadn't tried. We decided this week to stick to safe foods, just while he settles in. Next week we'll continue to intoduce new foods - one at a time. 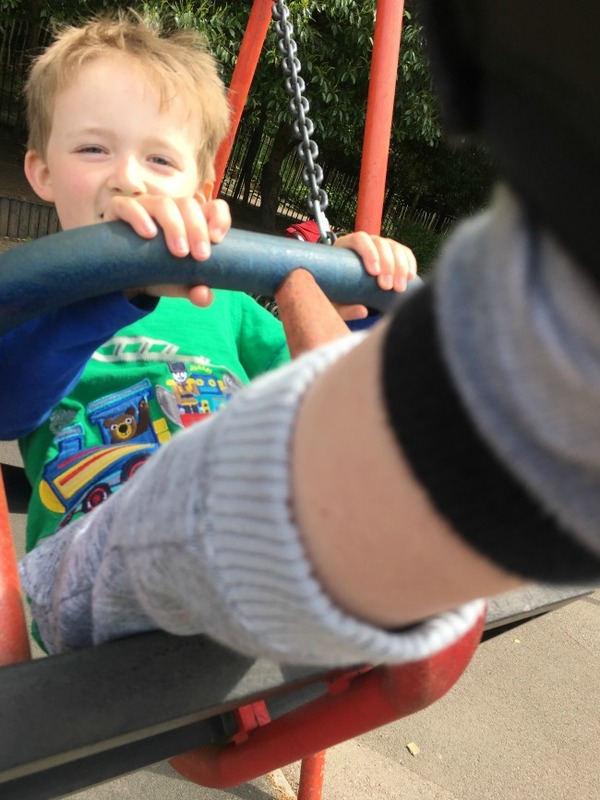 We have been lucky with the weather so we went to our favourite playground at Roath Park. 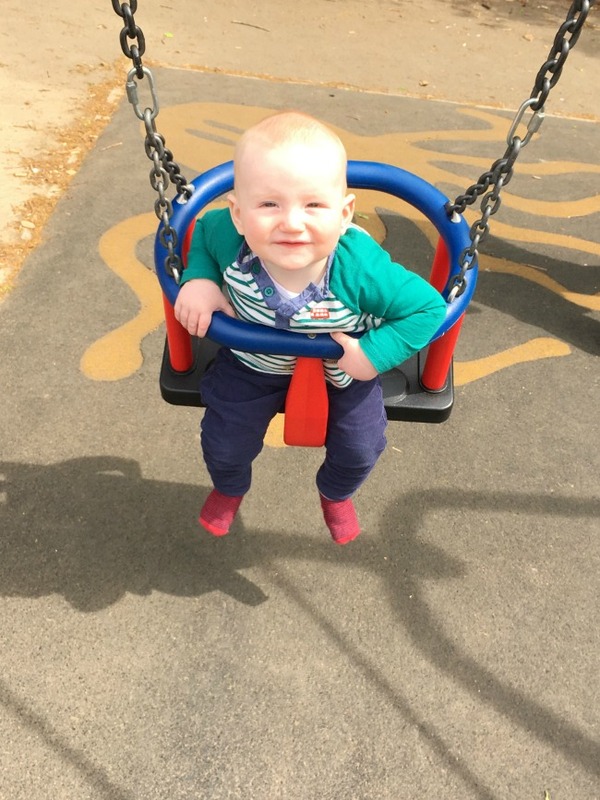 Bee had his first go on a swing and Bear showed him how it should be done. We are trying hard to continue to do things with Bear that he loves. 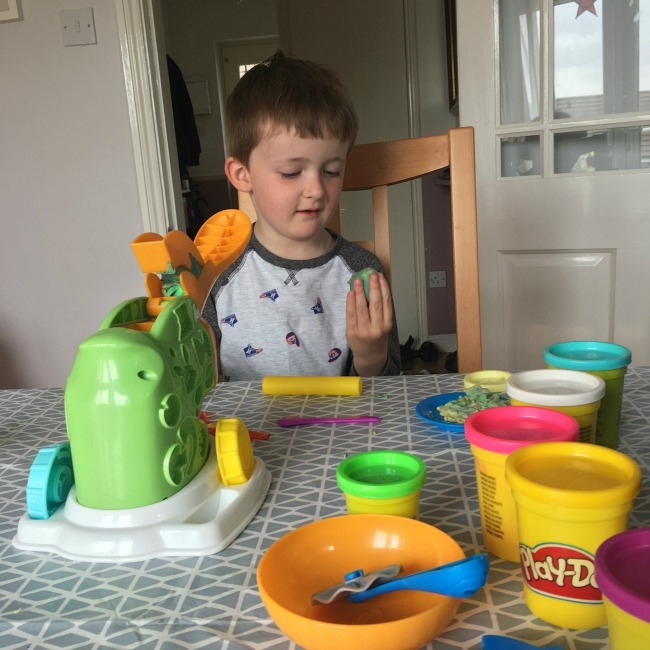 We had one day that was a bit wet and drizzly and Bear wanted to play with PlayDoh. This was a challenge as Grandad was cooking lunch in the kitchen and Bee was trying to eat the PlayDoh. If I put Bee on the floor he just crawled over to Grandad to be picked up. I'm sure it will get easier as I get better at juggling two children. I had five years between mine so in some ways it was easier, as the eldest (Bears Daddy) could go upstairs to play alone. It was also harder as we seemed to have Lego and other small bits all over the house. I need a list of games that they can both play that doesn't annoy Bear and that Bee can't eat it all gone! We have loved having Bee, we try very hard to make our days familiar to Bear. He goes to pre-school in the mornings and we collect him at 11.30am. We can't take him at 9am as his school is so far that during the rush hour we would take so long to get there and back, as soon as we got home we'd have to turn around to collect him. We do have a plan, Bear is going to have a childminder in the mornings, she will give him breakfast and take him to school. We will then collect him as usual. This was all sorted for the week after half term. So this week the childminder is on holiday as we all thought it was half term this week (the school gave us the wrong dates, these things happen). So this week and next (the real half term) Bear will be dropped off in the morning to us and spend all day here. It's good really, we get a chance to visit all the places we love while they are still quiet. Lets hope the weather stays warm and dry. We have spent a lot of time travelling to and from Caerphilly this week, on Saturday we visited Caerphilly Food Festival. I was a little disappointed as it was smaller than I expected and less diverse. I was hoping for street food and less sweet stalls. There seemed to be an abundance of fudge, sweets and cakes. We only found one cheese stall, and that only sold Caerphilly Cheese (of course). It is a wonderful event for children though. Bee and Bear went with their parents and Bear had so much fun. He had a donkey ride, his face painted and lots of goes on the fun fair. If you live near it is worth a visit. On Friday (our "Day Off") we went back to Caerphilly to finish pruning the hedge in Bears parents front garden. The hedge is a fast growing privet and had grown too tall and much too wide. We hard pruned a metre off the top to let more light into their front room. Next spring we'll cut one side, then the following year we'll do the other. 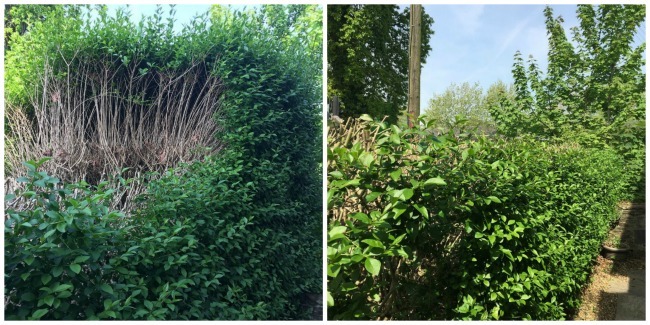 If pruning hedges in the spring and early summer you must check for nesting birds. 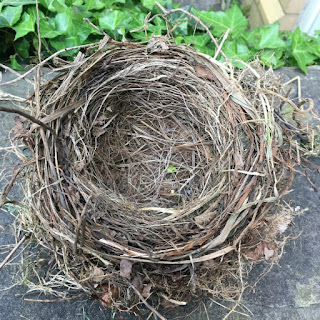 It is illegal in the UK to disturb nesting birds. 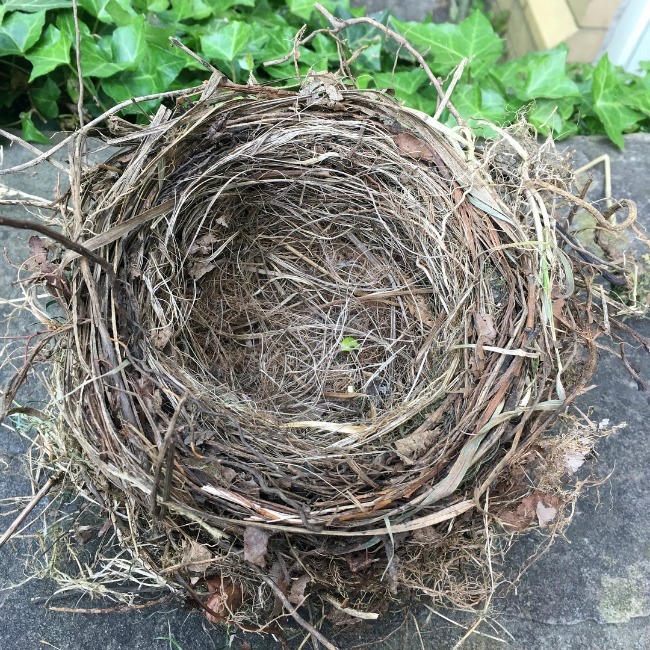 We were lucky to find an empty nest, and no birds, eggs or chicks. We also had a not so nice surprise. Hidden in the hedge (this hedge is almost two metres wide) were three plastic bottles filled with an orange liquid, they looked very old. Unfortunately we found out what the liquid was by the smell, one was leaking and it was urine! Who would do that? Throw bottles full of urine in a hedge? The empty birds nest, so much work has gone into making it. Wish me luck for next week, any tips are gratefully recieved! Especially things to do with a three year old and a nine month old.